Paul Delos Boyer received a BS degree in chemistry from Brigham Young University in 1939 and obtained a Wisconsin Alumni Research Foundation Scholarship for graduate studies. After he received his PhD degree in biochemistry from the University of Wisconsin in 1943, he spent time at Stanford University on a war-related research project dedicated to stabilization of serum albumin for transfusions. He began his independent research career at the University of Minnesota and introduced kinetic, isotopic and chemical methods for investigating enzyme mechanisms. In 1955, he received a Guggenheim Fellowship and worked with Professor Hugo Theorell on the mechanism of alcohol dehydrogenase. In 1956, he accepted a Hill Foundation Professorship and moved to the medical campus of the University of Minnesota. In 1959-60, he served as Chairman of the Biochemistry Section of the American Chemical Society and in 1969-70 as President of the American Society of Biological Chemists. Since 1963, he has been a Professor in the Department of Chemistry and Biochemistry at UCLA. In 1965, he became the Founding Director of the Molecular Biology Institute and spearheaded the construction of the building and the organization of an interdepartmental PhD program. This institutional service did not diminish the creativity and originality of his research program, which led to three postulates for the binding mechanism for ATP synthesis: i.e. that energy input was not used primarily to form ATP but to promote the binding of phosphate and mostly the release of tightly bound ATP; that three identical catalytic sites went through compulsory, sequential binding changes; and that the binding changes of the catalytic subunits, circularly arranged on the periphery of the enzyme, were driven by the rotation of a smaller internal subunit. 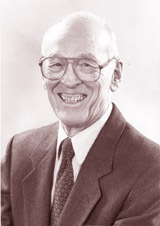 Paul Boyer was Editor or Associate Editor of the Annual Review of Biochemistry from 1963 to 1989. He was Editor of the classic series, The Enzymes. In 1981, he was Faculty Research Lecturer at UCLA. He received the Rose Award of the American Society of Chemistry and Molecular Biology in 1989; honorary doctorates from the Universities of Stockholm (1974), Minnesota (1996) and Wisconsin (1998); and the Nobel Prize in Chemistry in 1997.